Somasekhar Sundaresan is a corporate and securities lawyer and is practising as an independent counsel since August 1, 2016. 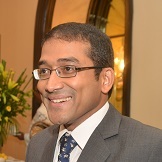 Prior to setting up independent counsel practice, Somasekhar was head of the Securities Law and Financial Sector regulatory practice at JSA, a national Indian law firm. He has been in practice for the past 18 years. At JSA, his commercial transactional practice covered M&A of listed businesses and regulatory advisory work for market intermediaries, while his contentious practice covered securities regulatory litigation, and acting as counsel before the Securities and Exchange Board of India, the Securities Appellate Tribunal and the Supreme Court of India. Member of the Working Group on Foreign Investment in India under the chairmanship of Mr. U.K. Sinha, which submitted its report in July 2010. Member of the Securities and Exchange Board of India’s Takeover Regulations Advisory Committee, and drafted Takeover Regulations, which has been substantially implemented. Consultant to the Financial Sector Legislative Reform Commission, which submitted its report in 2013, containing the draft Indian Financial Code, which contains new financial sector legislation for India. Member of the Securities and Exchange Board of India’s High-Level Committee to review and draft new regulations governing insider trading in India. Member of a committee of the Ministry of Finance to write new policy for issuance of global depository receipts, foreign currency convertible bonds and external commercial borrowings. Member of a committee of the Reserve Bank of India to review corporate governance in the Indian banking sector. Member of a Task Force of the Ministry of Finance to set up a Financial Sector Appellate Tribunal in India. Somasekhar is an invitee to the Federation of Chambers of Commerce & Industry’s central Steering Committee and an active member of its Capital Markets Committee. He serves as an independent director of rights-based NGO Oxfam India. He authors a fortnightly column titled Without Contempt in the Business Standard, a national business newspaper in India. Copyright © 2019 Courses & Seminars. All Rights Reserved. Site by Trew Knowledge.